Nice time! 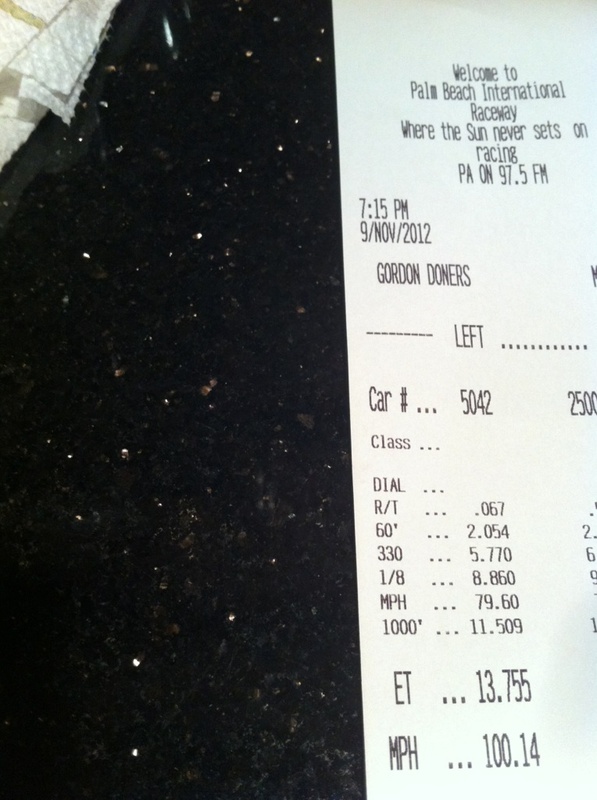 Best time I ran when stock was 13.87 @ 101 with my 3.5HR with 5AT, but only got 3 runs in and it was a really hot day. Haven't had it to the track since the SC went in, but hope to get there sometime this Winter when there's some cooler weather. Just need to try and get a set of drag radials first, as the 30 series 285's I'm running have little to no grip with the SC installed... 60' times will definitely suffer. Not sure if I miss this reply, you guess mention the sport mode on the 7AT is sluggish. Do you think driving it in M mode is the same, if you were doing a 0 to 60 or 1/4 mile run. just ran my stock 2010 g37s sedan today 13.89 . im getting my exhaust on monday so i will update you with my new time next week. That's a great time, but I'm assuming the mph is actually 121 mph and not 221 mph.. or maybe that's 221 km/hr which is really fast for that time, especially for an AWD car. I had a 1st gen Eclipse GSX that used to run high 11's/low 12's @ ~120 mph back in the day, so the numbers are very similar. I don't think my GTM SC G Sedan (RWD, not AWD like yours) will be quite that fast even with drag radials, but it should run solid mid 12's. What kind of whp is your G37 putting down with the GTM TT? Hey 2G - Thanks !! I thought i would post a pic of my time slip as well. Hope to have a better slip to show the next time i go !! 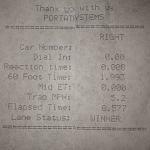 I went out to Countyline Dragway 1/8th mile track in Miami, FL last friday and here is my best time out of 3 passes in my 2010 G37 Sedan 7AT. ^ wow, crazy r/t on that run. almost nailed it! and a 1.9 60' is solid too. too bad you couldn't have gone the full 1/4 mile to see what your time would have been! I know man, the closest 1/4 mile track to me is 90 miles away. I live in Miami and PBIR is in West Palm Beach. Ill be headed up there soon with a couple G's from down here. Ill make sure to post up. You got a 8.5 in the 1/8 with 20s on? Impressive time, take those 20s off and head down to the 1/4 track , low 13s should be easy . Btw those are your mods in your sig? Are you awd or rwd? Yea I'd like to get 18's and put some drag radials before doing a 1/4 mile run. Those are my mods, Stillen Gen3's, Stillen Grounding Kit, AAM TP, Exhaustdepot ypipe, topspeed pro1 exhaust, and uprev tune. Here is the link to one of my 1/8 mile runs on you tube and I attached the same time slip. Last edited by moonlightv36; 02-05-2013 at 11:42 AM. Just curious... what kind of gains did you get from the UpRev tune? My VQ gained 30whp and 19wtrq. This obviously can vary on another VQ, the mods, the dyno, the weather, the tuner.... Personally it was a night and day difference for me. 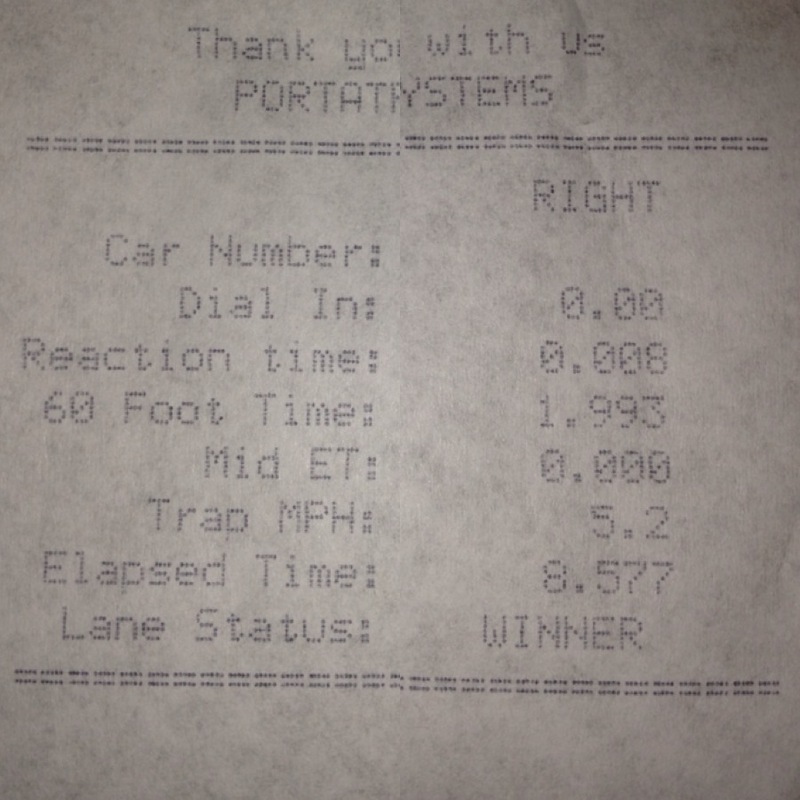 I also cut .5 seconds of my 1/8th mile time on 20's!!! Impressive , I'm really curious what your sedan with the mods would do in the quarter mile. Thank you, I'll post up a slip and video when I head up to the track.